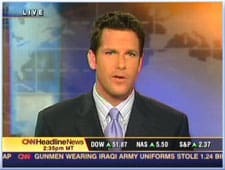 CNN Anchor Thomas Roberts expressed disappointment at a decision by Baltimore County Circuit Judge John G. Turnbull II to approve a request from Roman Catholic priest Jerome F. Toohey Jr. to serve out the final eight months of an 18-month prison sentence for sexual abuse in home detention rather than in prison. Toohey pleaded guilty in 2005 to sexually abusing Roberts between 1987 and 1989 when Roberts was a student at Calvert Hall College High School, a Catholic school for boys. At that time, evidence from a previously dismissed suit by another former student, Michael Goles, was used to obtain a stricter sentence for Toohey. That sentence has all but been erased. Toohey, whose behavior his lawyer claimed was the “byproduct of severe alcoholism”, has been kept in solitary confinement because of threats of violence from other prisoners. Roberts came out of the closet earlier this year at the National Gay and Lesbian Journalists Association conference in Miami.